Heat 1 tablespoon butter in a 10-inch skillet over medium-high heat. Add the chicken and cook until well browned and cooked through, stirring often. Remove the chicken from the skillet. Heat the remaining butter in the skillet over medium heat. 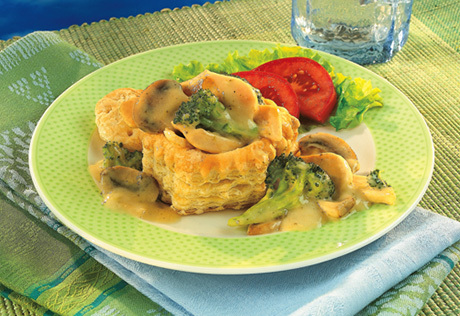 Add the broccoli and mushrooms and cook until the vegetables are tender, stirring occasionally. Stir the soup, milk and mustard in the skillet and heat to a boil. Return the chicken to the skillet and cook until the mixture is hot and bubbling. Spoon the chicken mixture into the pastry shells.